Winter is a great time to get into training at Steamtown National Historic Site. Located in downtown Scranton, Pennsylvania, at the site of the former yards of the Delaware, Lackawanna, and Western Railroad, the park incorporates the surviving elements of the DL&W Scranton roundhouse and locomotive repair shops. Built in the style of the original roundhouse, the visitor center, theater, and Technology and History museums, replace the missing portions of that structure. You can learn about the history and technology of steam railroads in the United States, and in Pennsylvania specifically. See many locomotives and freight and passenger cars, and climb aboard the locomotives to see their controls. Go back in time as you walk through a post office car and a business car. A steam locomotive with cutaway sections illustrates how steam engines work. Exhibits highlight the history of early railroads; life on the railroad; the relationship between railroads and business, labor, and government; and the history of the Lackawanna Railroad. 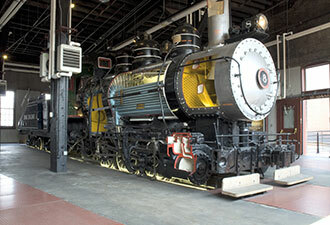 The Technology Museum features exhibits on railroad architecture, communications, track construction, and locomotive operations and appliances, as well as a full-scale layout of the Scranton Yards circa 1939. 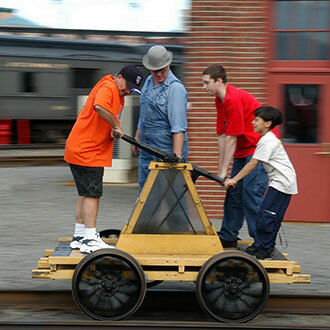 Also in the Technology Museum, a boxcar theater describes freight cars and their uses, and you can create a souvenir by posing for pictures at a wooden caboose. Steamtown offers a variety of demonstrations, tours, and excursions that show how railroads functioned in the age of steam. Park rangers and volunteers give guided tours of the locomotive shop on most days. Also available are programs on the history of Steamtown and, seasonally, a display of the Union Pacific “Big Boy” locomotive and demonstrations of the turntable. This winter, we will feature special film documentaries at the state-of-the-art theater on select Saturdays in January, February, and March 2010. All one-hour programs will start at noon and 2 p.m. and are included in the park’s entrance fee. On January 23, the documentary “The Knox Mine Disaster” features many first-person accounts of the January 1959 tragedy that helped mark the end of deep mining in much of the Wyoming Valley. On the 13th of February, African American History Month, join us for a screening of “Rising from the Rails: The Story of the Pullman Porter.” This award-winning, high-definition documentary chronicles the unheralded Pullman Porters, generations of African American men who served as caretakers to wealthy white passengers on luxury trains that traversed the nation in the golden age of rail travel. Steamtown’s 2010 Winter Film Series ends with “The Irish: Two Nations – One Heart,” (part I), on March 20. The documentary chronicles and celebrates the rich and indelible history of our region’s Irish immigrants. While the winter months offer the opportunity for visitors to explore our History, Technology and Roundhouse museums at a relaxed pace, visits during other seasons offer different experiences. Several working locomotives will take you on short excursions through the Scranton yard in the spring, summer, and fall. Longer excursions are scheduled with separate tickets. Download and print your copy of our 2010 Excursion Schedule here, and we will welcome you aboard at Steamtown National Historic Site!